Obasute Chorakuji Temple (姨捨長楽寺) is Tendai Buddhism temple located in Chikuma, Nagano Prefecture. It is known as the best moon view spot in Japan. Chorakuji was established in 10th century. Because of the beautiful moon view, the Hiku Master Matsuo Basho visited this place and read the poem. 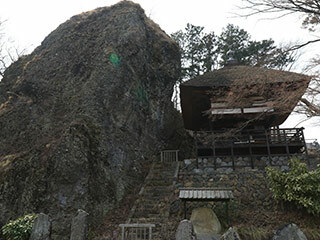 Chorakuji is located on Mt. Ubasute that has a great view of rice terrace. That the view of rice terrace is registered as the national scenic beauty. You can eat tasty Soba. 1. use JR Shinanoi Line to Obasute Station. Chorakuji is Tendai Buddhism located in Chikuma city, Nagano Prefecture. It was established in the 10th century. It is known as the best moon view point from Mt. Obasute. From the temple, it has a great view of rice terrace and Nagano area. The moon that reflected on the rice terrace is so beautiful. The famous Hikiu Master Matsuo Basho visited here and read this poem. By Matsuo Basho in 1688. When you visit Mt. Obasute, I can feel the pity of the old lady and the moon is so bright. I can feel the sadness of the old ladies those who were just left over here. I can imagine those ladies were also watching the same moon and crying. Tonight, I will be the friend of the moon, and let us think of those old ladies. Obasute-yama literary means leaving old mother mountain. In the old time in Japan, there is a custom that young son had to left their old mother at the mountain because of the low productivities, and their food was limited. However, in this area, old mother helped the son to solve the issue that the lord of this castle had. The lord of the castle recognized that the knowledge of the old people must be respected and abandon the old custom. Constructed in the middle of 18th century. Constrcuted in the early 19th century. 15m tall and 25m wide huge rock.